Hey, I'm back with another challenge entry. I figured I was on a roll so why quit now? Ha ha! 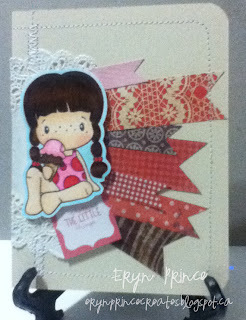 Anyways I have created a card for the current All That Scraps Wednesday Challenge. This week it is a colour challenge. The colours you are to use are pink, red and chocolate. To participate in the challenge you must use those colours and include a stamp that is sold in the All That Scraps store. Then link up to original challenge post. I got my main idea from the card I made for the Some Odd Girl Challenge. I liked the image off to the side and on the doily. I also liked the paper pieces with the fish tail banner ends. My main image is C.C. Designs Swiss Pixie Ice Cream Birgitta. I coloured her in the challenge colours. I popped her up on dimensional foam to make her stand out on the busy background. 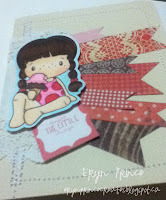 I also incorporated the theme colours into my background papers, which is a great way to use up some of your scraps. I added some sewing around the edges, just because (again) I liked the way it looks. The tag under her with the sentiment is from one of the paper pads that I got for Christmas, which is from Pebbles. 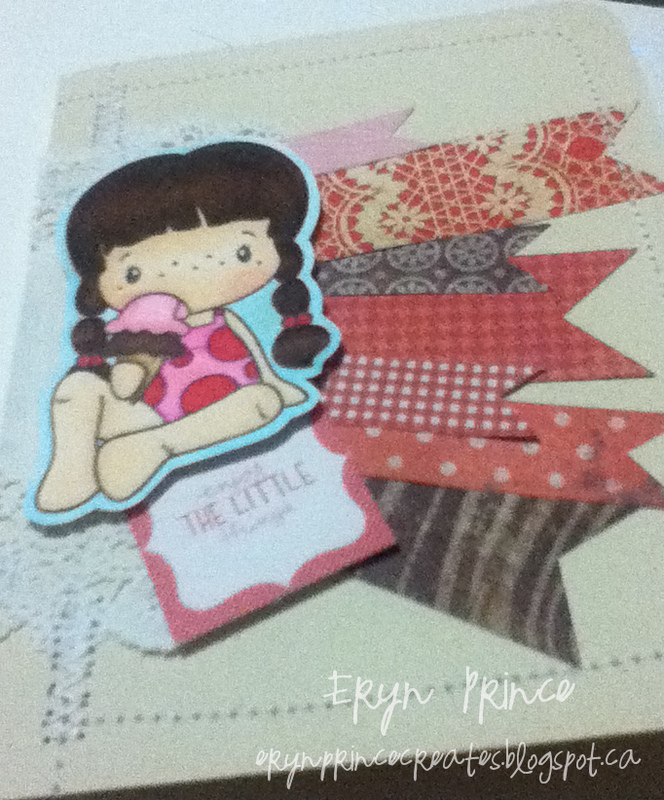 It is hard to see (sorry again for the poor image quality) but it says "enjoy the little things." I thought it was cute and fit into the theme as it was pink. OMGosh she is so darn cute, I love this! Thanks for playing with us over at ATS!!! What a lovely card! I love how you used the paper banners! She is a darling image too. I love that layout. Really cute card, and the stitching gives a great finish to the edges. Love how you used the banners, Eryn! And I love your profile piccie - cute pup! this is so sweet, I love all the cute banners behind her, just adorable. What a terrific card design! Loving those banners! What a great card! 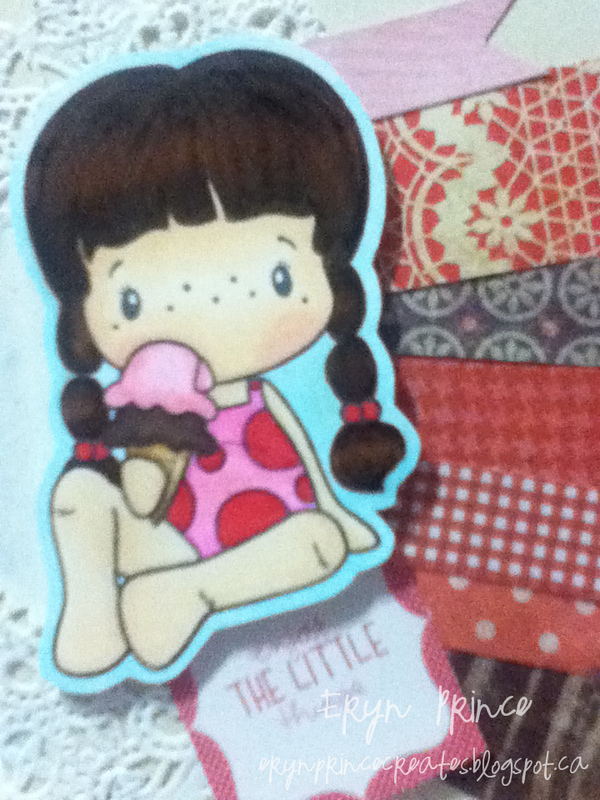 Just love that image and makes me want spring to come so much faster for ice cream!! LOL...thanks for sharing your card!